Next weekend, November 2nd to 4th, the Greenville College Digital Media Department will be hosting the annual 50 Hour Film Festival. 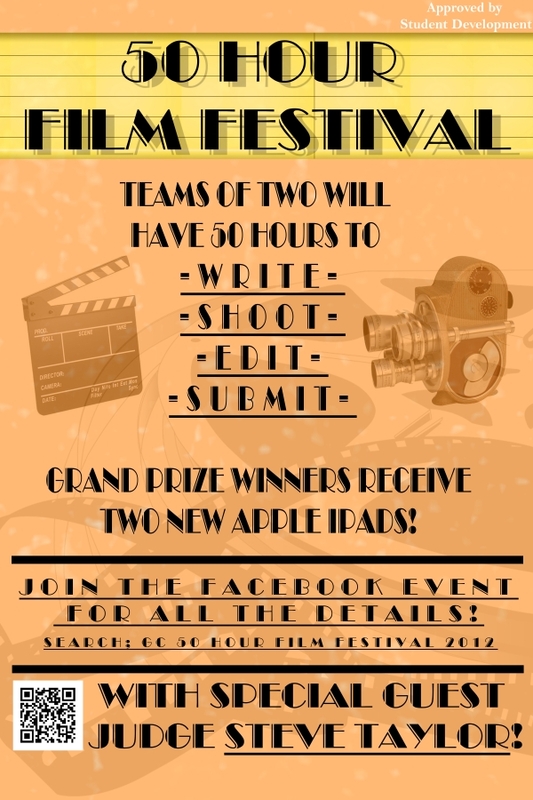 Teams of two will have fifty hours, starting at 8 pm Friday and ending 10 pm Sunday, to write, shoot, edit, and submit their video. The videos will be 5 to 7 minutes in length. All other requirements will be released on the Facebook page at 8 pm on Friday November 2nd. This article will also be updated with the full requirements for the videos. First place winners will each receive an iPad. The prizes for second place and third place are $50 and $25 Amazon gift cards. All submitted videos will be shown at the Globe on Wednesday November 7th at 9:30 pm. UPDATE: “Stuck” by Andie and Garrett Rea wins the 2012 50 Hour Film Festival!